Wi-SUN is the short form of Wireless Smart Utility Network and promoted by Wi-SUN Alliance. Wi-SUN Alliance is a consortium of Global Corporations and World Leaders in Smart Utility, Smart City and Internet of Things Markets. Wi-SUN network is developed as per IEEE 802.15.4g which defines PHY and MAC layer specifications. Wi-SUN brings Smart Ubiquitous Networks to service providers, utilities, local government and other enterprises, by enabling interoperable, multi-service & secure wireless mesh networks. 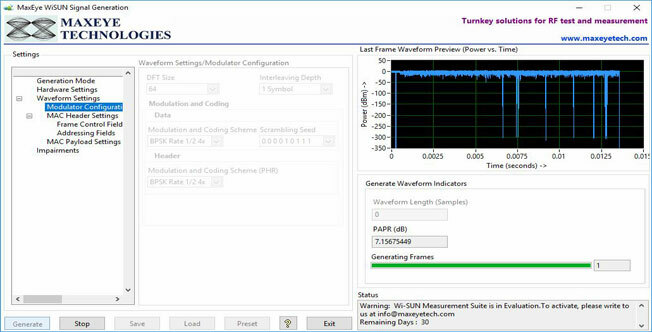 MAXEYE Technologies provides generation and analysis functions in LabVIEW and .NET for generating and analyzing the Wi-SUN standard complaint signals using National Instruments Vector Signal Generators (NI VSG) and Vector Signal Analyzers (NI VSA) or Vector Signal Transceivers (NI VST). 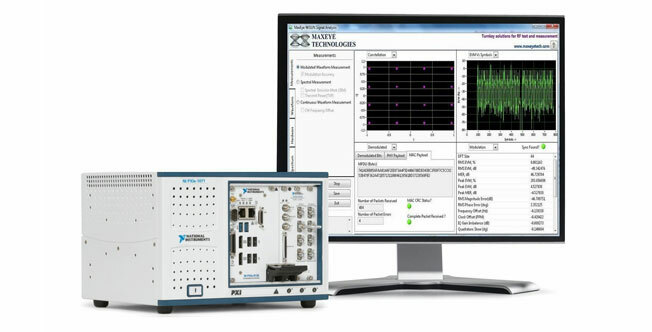 The IEEE 802.15.4g Standard supports multiple Physical Layer modes; the current version of the toolkit supports the MR-OFDM physical layer. The standard defines different modulation types, data rates based on the DFT Size. The design validation and verification stage of development requires more intensive analysis tools such as constellation plot to debug various issues in product design. The production test requires more definitive measurements such as EVM and Frequency Offset so you can compare performance to test limits.